A Romanian man has been arrested and charged with conspiracy relating to his involvement in a prolific ATM malware campaign. Emanual Leahu, 30, was arrested in the western city of Bacău, Romania by the London Regional Fraud Team (LRFT) London police run by the City of London Police on Tuesday 20 September, extradited to the United Kingdom last week. 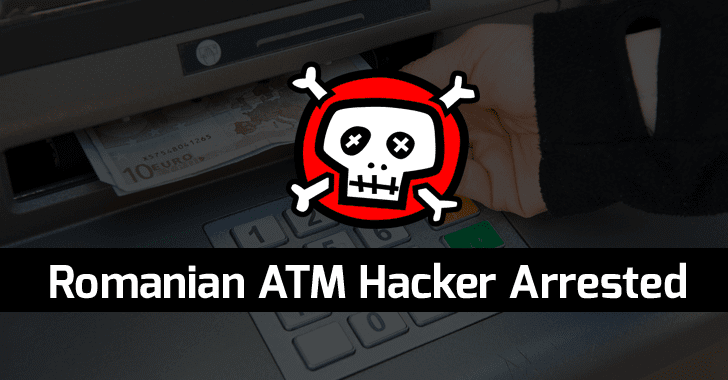 Leahu is believed to be a member of a European ATM hacking gang that stole more than £1.5 Million ($2 Million) from cash machines across the UK in 2014 using ATM malware to bypass security controls. The gang physically broke into ATMs to directly load malware onto the machines, allowing it to withdraw "large amounts of cash." The malware was good enough to erase itself to hide its tracks, making it difficult to identify the culprit. Luckily, due to the gang’s carelessness, one of its members was recorded by a hidden ATM surveillance camera, which allowed the police to identify and arrest him. The gang hit 51 ATMs in standalone public places across the UK, including London, Portsmouth, Bognor Regis, Brighton and Liverpool over the 2014 May Bank Holiday weekend. This is the third arrest in the case after Grigore Paladi and Teofil Bortos, who were arrested and sentenced in 2014 and 2015 to 5 and 7 years in jail for their roles in robbing vulnerable ATMs. According to the UK authorities, the gang has five members, with the other two suspects still remain at large in Romania. European arrest warrants have already been issued in their names as well. Police also ensured bank customers that they are not affected by the theft as the gang’s malware only tricked the bank ATMs to release cash, not from customers’ accounts. UK Police has recently risen to help international crime fighting efforts dedicated to anti-fraud and cracking down ATM hackers. "Operating across borders has its challenges, but overseas law enforcement has been extremely co-operative, especially in Romania," LRFT head, detective inspector Matthew Mountford said. "Working together we will continue to ensure that organised criminal gang members have nowhere to hide." Earlier this year, European police arrested eight members of an international ATM hacking gang who robbed ATMs across Europe and beyond using Tyupkin malware that made them the made millions in cash. ATM fraudsters have risen in past few years. Just over a month back, the Central Bank of Thailand (BoT) issued a warning to all commercial banks about security flaws in their ATMs that made hackers over 12.29 Million Thailand Baht (over US$346,000). A few months ago, ATM fraudsters managed to steal ¥1.4 Billion (approx. US$12.7 Million) from some 1,400 ATMs placed in small convenience stores across Japan.